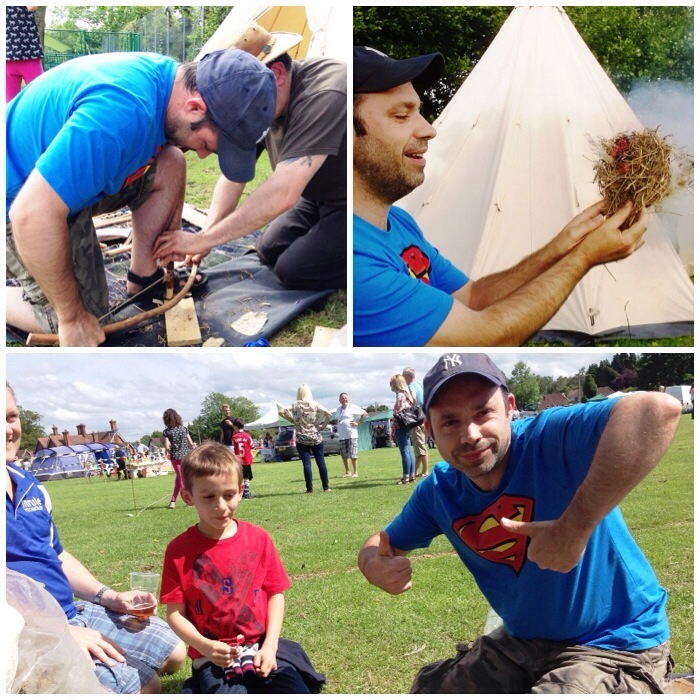 About a month ago I was asked to help out at my local village fete by running some bushcraft activities. 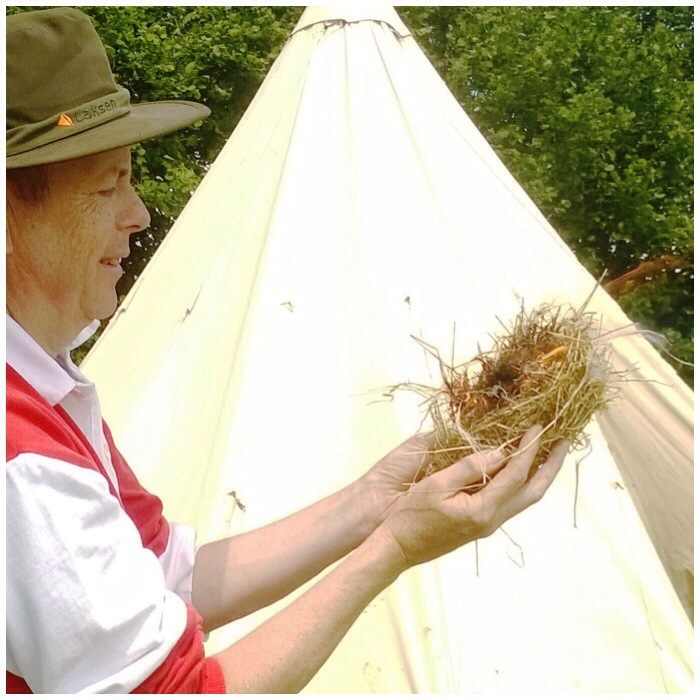 Space on the field was quite limited so I could not set up ranges for the bows or the Atlatls – my first choice – so instead I opted for fire, hammocks, camp set-ups and the whimmy diddle. 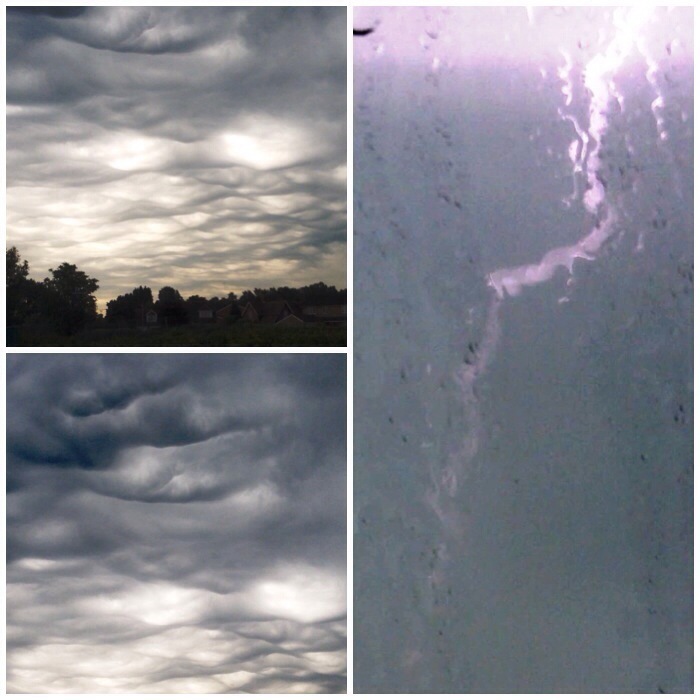 I arrived at 8.20am to be greeted by these dramatic mammatus clouds (known as upside down clouds). 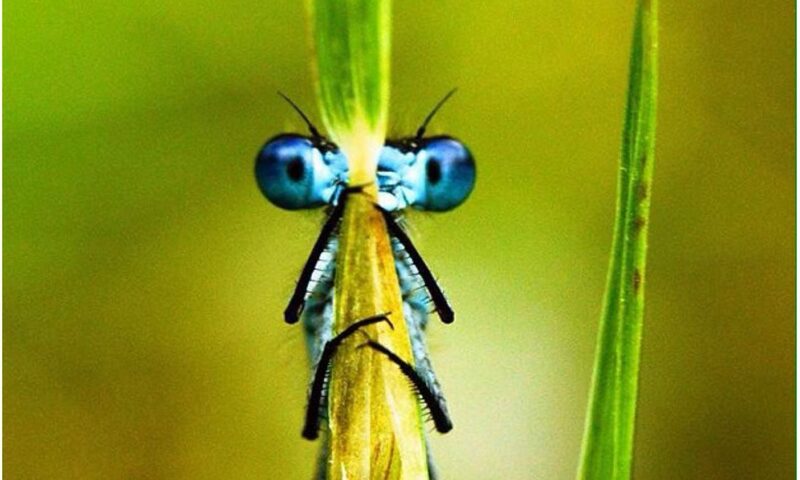 They are sometimes spotted preceding a thunderstorm. In a matter of minutes the rain was lashing down and the picture on the right is a still of a lightning bolt I caught on video. The rain carried on in bursts for the rest of the morning as I set up. I was a bit concerned that all my tinders and fire sets would be a bit damp. I set up my tipi, a fire area, some campfire cooking set ups and a hammock for folk to try out. Thankfully by the time the fete opened at midday the rain had stopped and the skies were clearing and my kit was all still dry. As soon as the fete opened I was kept busy. There were lots of different activities, some you paid for and some you did not pay for. 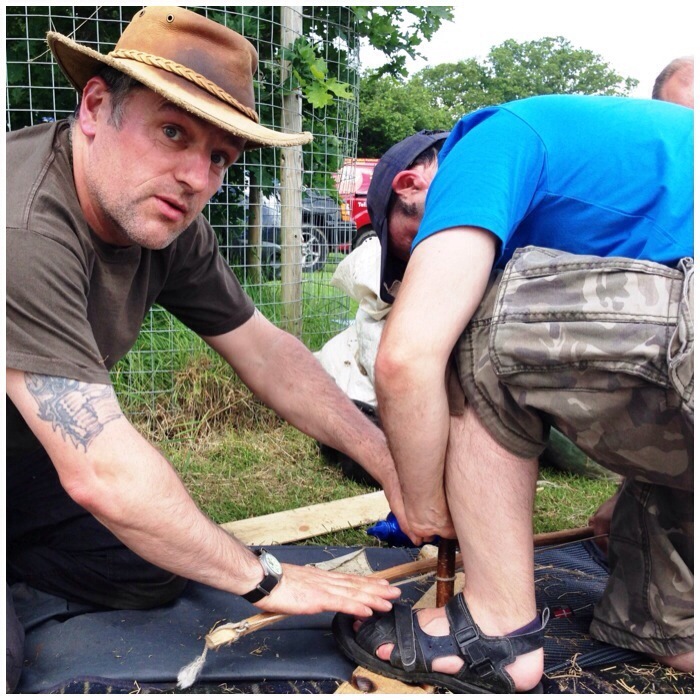 I had agreed to run my activities for free partly because it was a nice opportunity give something to the community and partly because I love seeing people try out bushcraft and discover these ancient skills for themselves. A quick and easy-to-learn activity is the use of modern firesteels. In no time at all the kids were lighting up Vaseline-smeared cotton-wool balls and using smouldering char cloth to get tinder bundles going. 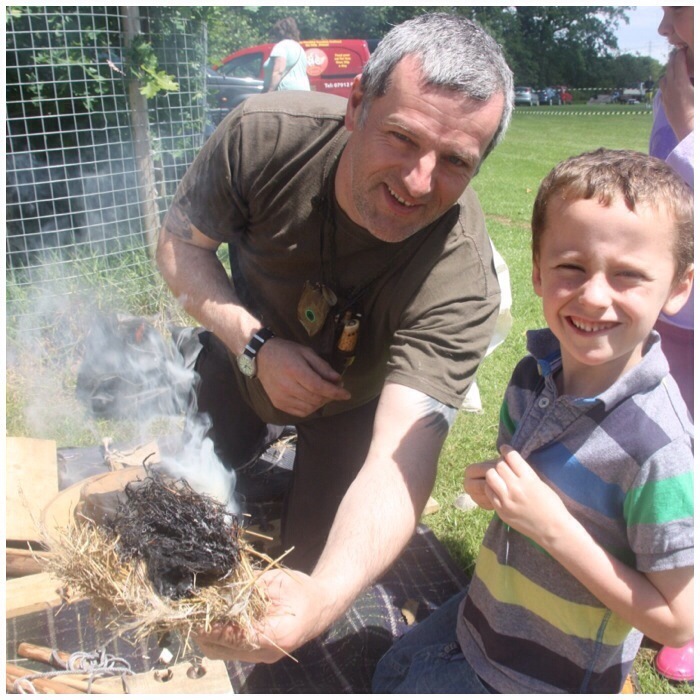 I try to make each of these activities into little classes that include a little discussion at the beginning around permissions and the safety of making a fire. 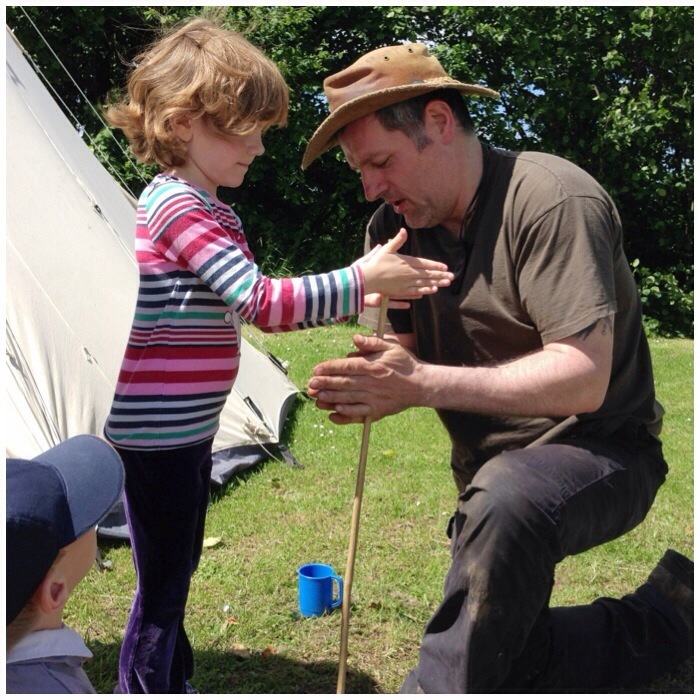 One of my favorite bushcraft toys is the whimmy diddle. This was taught to me a few years ago by the guru of bushcrafting Mors Kochanski. I love the way I can make the little propeller go one way and then the other as if by magic but best of all I love watching other people trying to figure out for themselves how to do it. 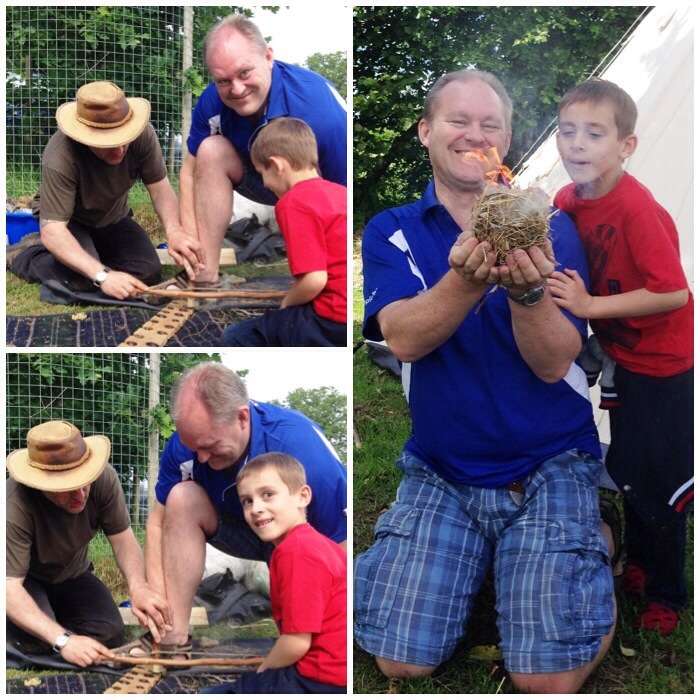 During the day a number of dads came up to me (no mums this time, for some reason) and asked me to help them make fire using the bowdrill with their sons. I think this set of pictures kind of says it all in terms of how special a moment this can be. It was not all work work work; I was able to keep the gas wood burning stove my friend Fraser from Coastal Survival gave me and so I always had a brew on the go. 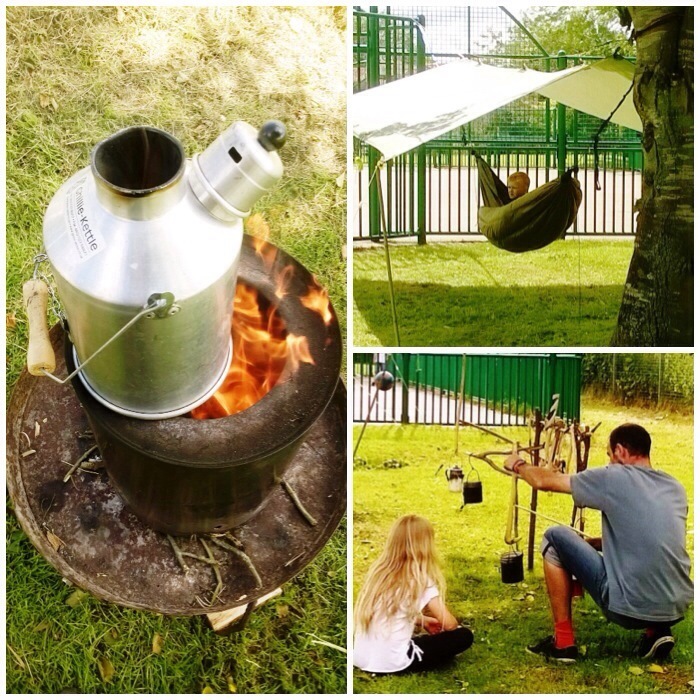 While I was busy teaching, others just chilled out in the hammock (this was very popular and quite a queue formed) or studied the various campfire cooking set-ups I had put up. 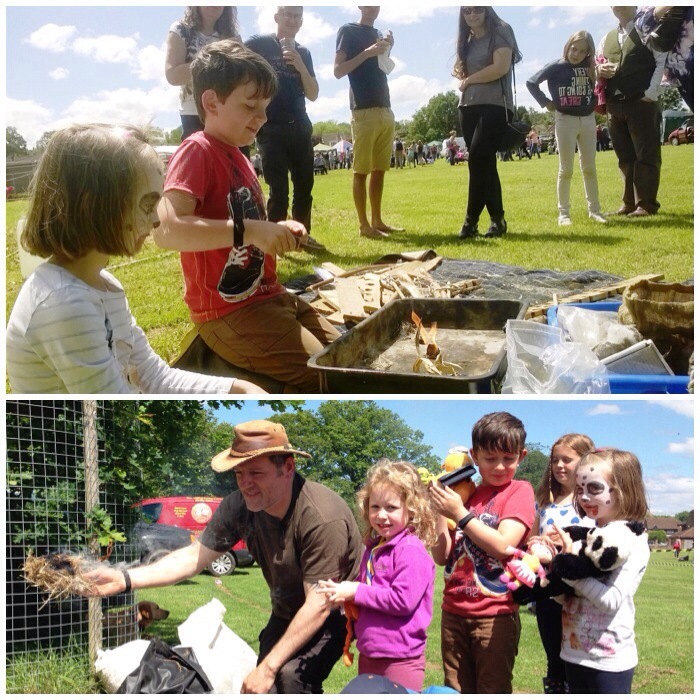 I hadn’t really planned to use the handrill but someone asked about it so I gave a demonstration (thankfully I got an ember), and then before I knew it I had loads of kids asking to have a go. I explained that this would usually be done in family groups (and in some societies still is) so to make it easier for everyone. Before long we were twirling away taking it in turns. I think we only had one failure, but we kept the dust we had produced from that one to help build up a successful ember using the bowdrill instead. At the end of the day I lost count of the number of handrill sessions I did: I do remember having really sore hands (even sorer the next day) but it was all worth it. Occasionally I gave some one-to-one tuition on the bowdrill to give my hands a little rest from the handrill. As I did not have a great deal of time with each person I tried to help out where I could. 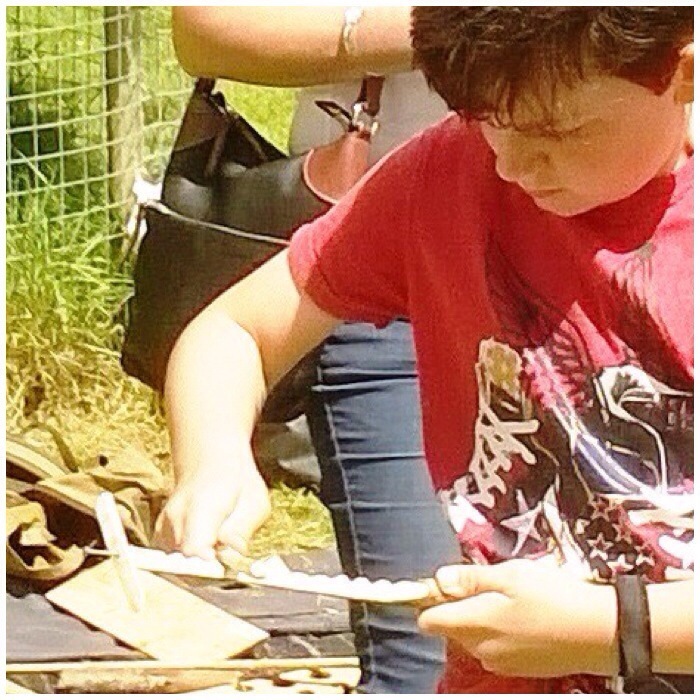 In the picture below all I am doing is showing the student how to keep the bearing block still and my right hand is stopping the bow from see sawing (I am not holding it at all). 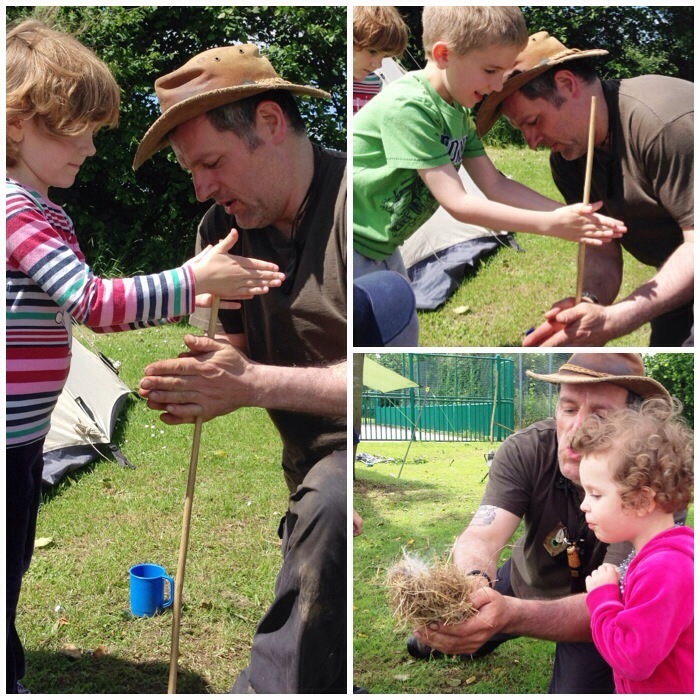 It was not all handrill with the kids – sometimes we got the bowdrill out with spectacular results. Plenty of smiles after each time. 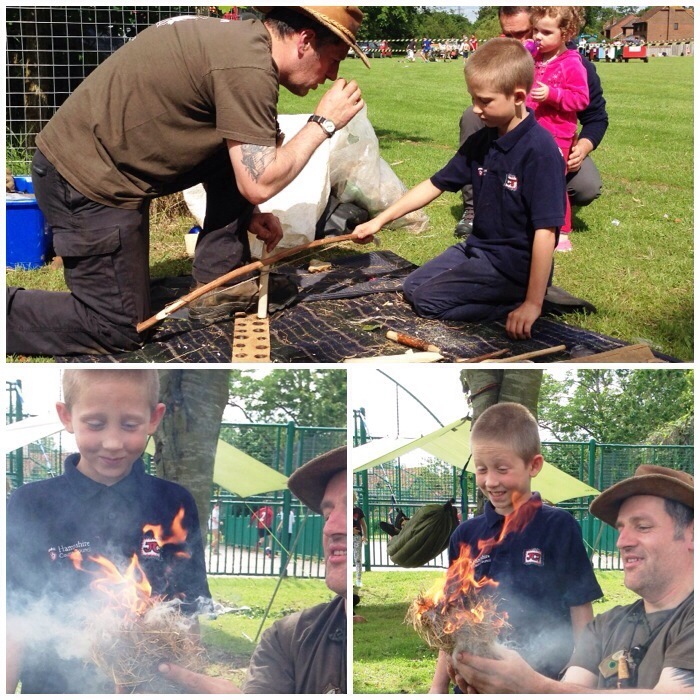 All in all I had a fabulous day lighting fires, teaching the whimmy diddle, discussing campfire cooking set-ups and ensuring as many kids as possible got to try the hammock out. I am told that the rest of the fete was a success with loads of activities but I never got to see any of it. I managed to get away from the stand once to go to the toilet and my wife Alison brought me what must have been the largest pork roll ever from the hog roast stand (and for taking all these pictures). My kids had a great time and managed to pop back to see me every now and then. 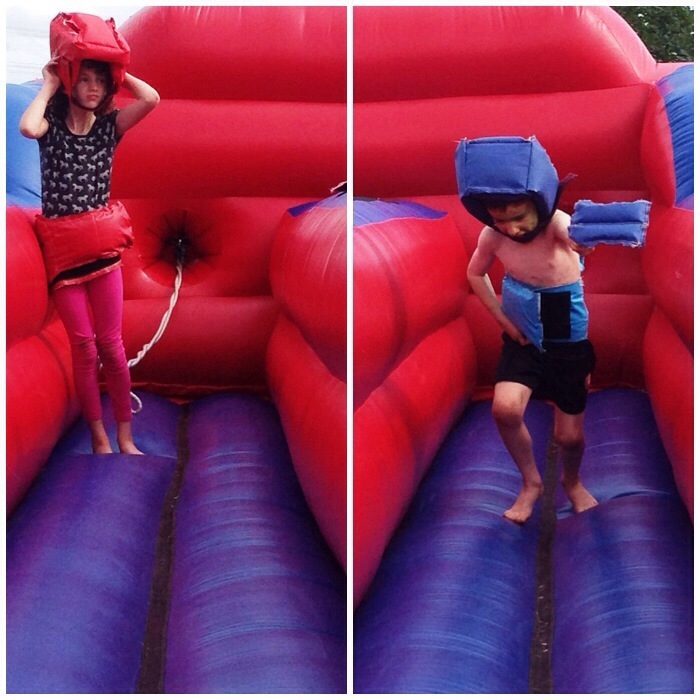 The only problem with being part of an event like this is that you miss seeing all the other activities, such as this inflatable tag challenge which my kids obviously loved.